Grilled pork chops . . . now less likely to kill me thanks to the power of beer! 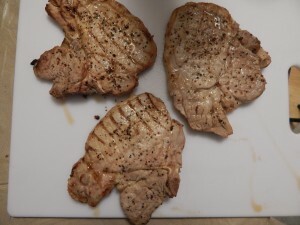 Yesterday, however, a discovery was announced that holds great personal importance to me — scientists announced that marinading pork chops in beer lowers the amount of a carcinogen known to come from grilling. Science, beer, and grilled pork all came together in one wonderful result — beer is good! Specifically, here’s what the study found. Pork chops marinaded in beer exhibited lowered levels of polycyclic aromatic hydrocarbons (PAHs) after being grilled on a charcoal grill, compared to non-marinaded pork chops. Polycyclic aromatic hydrocarbons (PAHs), sometimes called poly-aromatic hydrocarbons, are molecules produced when carbon-rich fuels (in this case, charcoal) burn incompletely. They can be found in soot, smoke and wherever hydrocarbons (oil, gas, etc.) have been burned. They are also found in grilled meats and smoked fish. These molecules are composed of fused carbon rings, without any side chains. Various PAHs are known to be carcinogenic, mutagenic, and teratogenic. (Teratogenic means the substance can interfere with the development of an organism.) And still others are strongly suspected to be. The fused ring structure of PAHs make them flat and some scientists believe that these flat molecules intercalate between the base pairs of DNA and disrupt its function. On the other hand, some PAHs are known or suspected to confer little or no health risk. It’s a big class of molecules and it all depends on how a particular molecule interacts with an organism. PAHs are not some Johnny-come-lately carcinogen. In fact, the PAH benzo[a]pyrene was the first identified carcinogen. In addition, chimney sweep’s carcinoma — which is brought about by exposure to soot — was the first type of cancer linked to an occupation. The English surgeon Percivall Pott first made the connection in 1775. Anthracene. There are also PAHs made of 4 or 5 rings in a row. 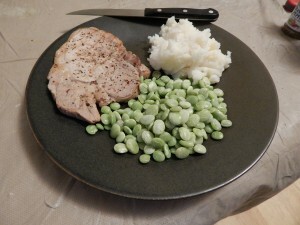 The good news is that researchers determined that marinading pork chops in beer reduced the amount of dangerous PAHs in the meat. Specifically, the researchers tested three types of beer — a Pilsner, a non-alcoholic Pilsner, and a “black beer.” (I’m guessing this is a stout or porter, as the authors at one point mention that it is an ale. The study was done by Portuguese and Spanish scientists and they don’t say what the beers are beyond the fact they got them at their local supermarket.) The meat was marinaded for 4 hours, a time they previously concluded was required for the full effect. It was then grilled over charcoal, at 200–230 °C (390 –450 °F), until it was well-done. Researchers then looked for 8 PAHs, known to be carcinogens, in the control and experimental samples. What they found was that the black beer blocked the formation of 53% of the PAHs, compared to the non-marinaded meat. The non-alcoholic beer blocked 25%, and the Pilsner beer blocked 13%. The researchers also tested the “anti-radical activity” of the three marinades and found that the black beer scavenged 68% of the radicals, followed by 37% in the non-alcoholic beer, and 30% in the Pilsner. So basically, if you like to grill, marinading the meat in beer will reduce the amount of PAHs that form during grilling. The “black beer” did better than the Pilsner, but the scientists did not test to see if intermediately-colored beers, such amber ales, fell between the two results. The non-alcoholic beer did better than the Pilsner, which indicates that color isn’t the whole story. The authors also mention that ales have more anti-oxidants than lagers, and this is likely a piece of the puzzle. Other things you can do to reduce your exposure to PAHs is to clean your grill grate before cooking to remove any blackened residue, and not to grill your food until it is charred. In addition, avoid flare-ups, in which the flames actually contact the outside of your food, leaving black marks. The researchers haven’t shown that marinading pork chops in beer reduces the risk of cancer. However, given that a beer marinade reduces the amount of cancer-causing agents in the pork, that inference is logical. Hopefully, this line of research is expanded. I have been pretty much marinated in beer for the last few years myself? I’s my own form of cancer protection. Thanks for the article. Where else would you get this kind of story? Cheers! Wouldn’t black beers have more acrylamide from the roasting process?